26967 Wildwood Pines Ln, Bonita Springs, FL.| MLS# 218043683 | Southwest Florida Residential Real Estate for Sale. WILDWOOD PRESERVE IS NOW OPEN FOR SALE! 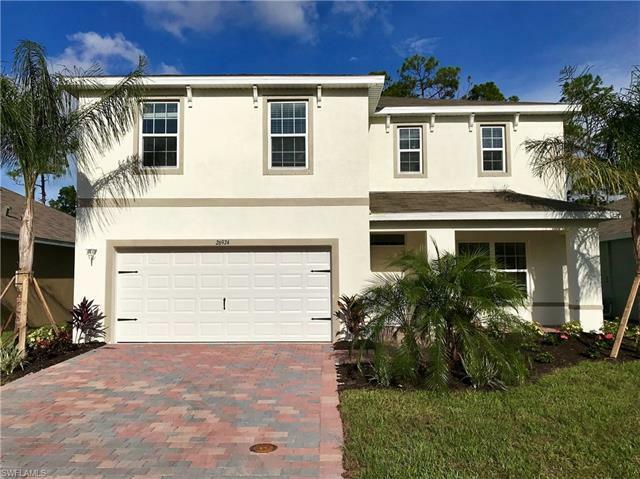 This is a great opportunity to own a brand new home centrally located in Bonita Springs! The two story Galen floorplan offers 2432 square feet under air and boasts 4 bedrooms plus a den and 2 and a half bathrooms. The total area is 2367 square feet. This home has an open floor plan making it convenient to entertain guests. All the appliances including washer and dryer come with this home. The ownerâs suite has a large walk in closet and dual sinks in the bathroom. 18 inch tile in living area with carpeting in the bedrooms. There is plenty of room for a pool or a fenced in oasis on the fully sodded, irrigated and landscape yard. This brand new home is located on the corner of Imperial and East Terry. This location will provide residents with quick and convenient access to the features that make living in Southwest Florida so fulfilling. Only minutes away you will find the beautiful beaches along the Gulf of Mexico, glorious golf fairways, outstanding shopping and dining and a vast array of attractions involving the arts, professional sports, nightlife, entertainment and more.